DETROIT – Like athletes who burn fat and build muscle to become more competitive, the 2014 Chevrolet Silverado 1500 and GMC Sierra 1500 strategically replaced traditional steel with lightweight, high-strength steels for improved capability, safety and fuel efficiency. High-strength and ultra-high-strength steels make the Silverado and Sierra's fully boxed frames and cabs lighter and stronger, helping the trucks deliver the best fuel economy of any V-8 pickup, up to 23 mpg highway. They also have class-leading towing capability of up to 12,000 pounds when equipped with the available 6.2L V-8. Similarly, making the most of mass also enables Silverados and Sierras equipped with the 4.3L V-6 to tow up to 7,600 pounds, the highest for any standard V-6 in the segment, with EPA highway fuel economy of up to 24 mpg. "Our customers tell us they want better fuel economy, but only if it doesn't come at the expense of capability," said Jeff Luke, executive chief engineer of the Silverado and Sierra. "By using lightweight materials like ultra-high-strength steel and aluminum for key structural parts and components in our new trucks we were able to improve both capability and efficiency." 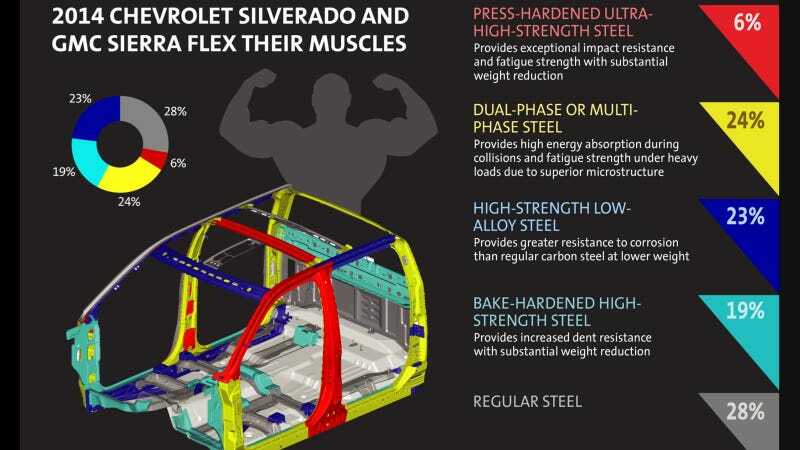 It's been said that stronger muscles and bones help prevent injury, and the same can be said of the high-strength and ultra-high-strength steels that make up two-thirds of Silverado and Sierra's cab structures, including A-pillars, B-pillars, rocker panels, roof rails and underbody. High-strength steel is several times stronger than mild steel. These rigid materials helped Silverado and Sierra become the first pickup trucks to receive the highest possible 5-star Overall Vehicle Score for safety since the National Highway Traffic Safety Administration changed its New Car Assessment Program for the 2011 model year. Similarly, the main rails and key cross members of Silverado and Sierra's updated frames are high-strength steel with major elements hydro-formed for reduced mass and improved strength. Their pickup boxes are made from roll-formed steel for increased strength and reduced mass, compared with the stamped beds used by major competitors. According to U.S. Steel Corp., the use of advanced high-strength steels is the fastest-growing trend in auto manufacturing today. Parts made from high-strength steel can be as much as 39 percent lighter than parts made from traditional steel. Strong, lightweight aluminum alloys also play a key role in Silverado and Sierra by reducing the weight of the trucks' engines, front suspension components, hoods and other parts. All three EcoTec3 engines use aluminum blocks and cylinder heads to reduce mass for improved fuel economy. Direct fuel injection, Active Fuel Management, or cylinder deactivation, and continuously variable valve timing, a combination not found in competitor trucks, also contribute to Silverado and Sierra's fitness.